In what was arguably the busiest and most franchise-altering offseason for the Toronto Raptors, this squad enters the 2018-19 season with even higher expectations than ever before. It’s Finals or Bust for this squad, but can this team outlast the likes of the Celtics and 76ers? We will cover that and a lot more in our season preview, with some personal analysis and some regular season and postseason predictions, but first let us walk you through the additions and subtractions on this team. The coaching staff saw a massive overhaul, with the first major surprise of the offseason coming in the form of Dwane Casey’s dismissal following the embarrassing sweep to LeBron James and the Cavs. The Raptors fired the soon-to-be Coach of the Year in what Masai had labelled “the hardest decision” of his life. Most anticipated a brand new outside voice would be brought in, one that would impliment new systems and a new culture and ways of thinking. Ultimately, the Raptors brass decided to stick with what was familiar, hiring the current Raptors assistant coach Nick Nurse to take over the reigns. Nurse was the mastermind behind the revamped offense that the Raptors displayed the previous season, and the Raptors believe that with Nurse at the helm, the offense can run at an even more effective rate. It seemed as though Raptors nation was divided about the move on social media. Some seemed to understand the logic, while others cried foul over replacing the Coach of the Year with his assistant. With the hiring of Nurse, it was assumed that most, if not all the remaining coaching staff would depart, and that’s exactly what happened. Rex Kalamian went to the Clippers as an assistant under Doc Rivers, and Jerry Stackhouse departed from the Raptors 905 to take a gig with the Memphis Grizzlies as their assistant coach (don’t be surprised to see him get some NBA head coaching whispers soon, especially if Memphis gets off to a slow start). The Raptors definitely took some losses in the coaching department, but hopefully Nurse and his team of newly hired assistants can gel together quickly and make the players feel comfortable on both ends of the floor. For those that thought that Masai would be content with just a coaching overhaul, they were mistaken. In a move that trumped the firing of Coach Casey as the most shocking move of the Raptors offseason, Masai Ujiri and Bobby Webster traded DeMar DeRozan, Jakob Poeltl and a protected 1st round pick for disgruntled superstar Kawhi Leonard and 3-and-D specialist Danny Green. I’m not gonna get into the trade too much, because I already did that when the trade was announced, which you can read here. Instead, I’ll provide the Coles notes. The Raptors traded away the most loyal player this franchise has ever seen in DeRozan (who was open about his intentions of retiring a Raptor) and arguably top 15-20 player in the league. We also traded away a young promising big in Poeltl, who has one of the softest hands in the league for a big man. As much as it hurts to trade away a player like DeRozan, it’s not everyday you can trade for a top five player in the NBA, and when that opportunity comes knocking, you have to capitalize on it. Great work by the Raptors to come out of nowhere and seize the opportunity. While some media were quick to jump on the hype train and report that Kawhi had ZERO desire to play in Toronto, we know now that it was definitely all a lie. Kawhi had quite the introductory press conference, and seems to be embracing the opportunity to play for Toronto and the Raptors organization. It appears as if he has taken a leadership role on this team, as told to us by Josh Lewenberg via Danny Green. Danny Green on Kawhi Leonard: "He's definitely more vocal than he's ever been, on and off the court. It looks like he feels comfortable. It looks like he feels at home." Saying all of this, the Raptors still haven’t played a regular season game yet, and they can either gel incredibly well together and once again lead the East in wins, or they could slowly crumble and be forced to make some tough decisions come trade deadline day. What Should Raptors Fans Expect? Whatever anybody’s expectations of the Raptors may be this season, there is no denying that they are in the top tier of teams in the East, that being the Raptors, Celtics and 76ers. I’ve seen people rank the Raptors as the best of the three, just below the Celtics as a 1B type team, or below both the Celtics and 76ers as the third best team in the East. My take on it is simple. I don’t believe the 76ers will overtake either the Raptors or the Celtics in the standings, and we should expect them to finish 3rd in the East. Let’s not forget that the 76ers went on a 16 game winning streak to end the year, which propelled them into the 3rd spot in the East to overtake Cleveland. Before that streak, the 76ers had a record of 36-30, which is nothing to be impressed by. The Celtics and Raptors were consistently 1 and 2 in the East rankings all season long, which is why I have them over the 76ers. When evaluating the Celtics, you can see a team that is loaded with talent. They have Kyrie Irving, arguably the league’s best point guard, leading the charge down the floor. Jayson Tatum is one of the league’s most polarizing young stars. Jaylen Brown is poised to take another step. Playoff heros Terry Rozier and Al Horford return for another year. They are deep and skilled, but still face a lot of questions. Can Gordon Hayward perform at the caliber that we are used to seeing him play at? He sustained a nasty broken leg injury that required plates and screws, which may hinder his mobility and strength moving forward. Can Irving stay healthy for a full season? Kyrie has never played more than 75 games in a season, and his last three years he has played 53, 72 and 60 games. Can Horford maintain his current level, or is he due for a decline? On the flipside you have the Raptors, who are also an incredibly skilled and deep team, but still have questions associated with them as well. The roster is upgraded with the additions of Kawhi Leonard and Danny Green. When healthy, Leonard is a perennial MVP candidate. He’s the league’s best defender and can score from almost everywhere on the floor, while possessing the ability to find the open man and create plays. Danny Green has the ability to give you 3 point shooting while giving you a solid defensive effort on the other end. 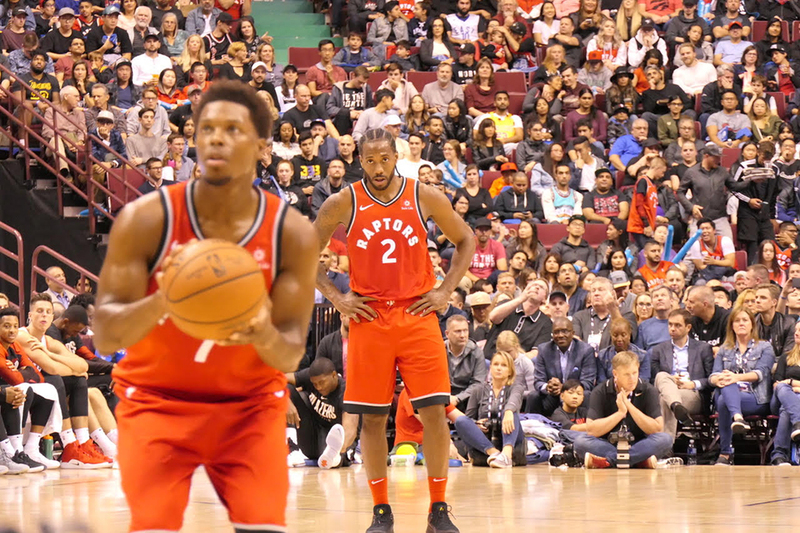 The Raptors have arguably the best player in the East and the best bench depth in the NBA, but there are still concerns coming out of training camp. Will Kawhi gel with the coaching staff and players? Will Kyle Lowry be able to put the emotions of losing DeMar aside and embrace playing with Leonard? Will the bench mob be able to repeat and even improve on their stellar 2017-18 campaign? Will young stars OG, Pascal and VanVleet be able to take that next step? Having said all of this, I believe the Raptors will finish first in the East with a record of 61-21, with the Celtics not far behind in a close second at 60-22. I have no issue with people believing that the Celtics will finish above the Raptors, because both are really good teams. Just don’t give me that garbage that the 76ers will finish above either the Raptors or Celtics. Not happening. Want to know how the 2018-19 NBA Regular Season and Playoffs will go down? Well let me tell you with my predictions. I will definitely go back to this at the end of this season to boast my correct predictions while expose my not-so-great predictions. Newer PostWho Should The Raptors Target at the Trade Deadline?